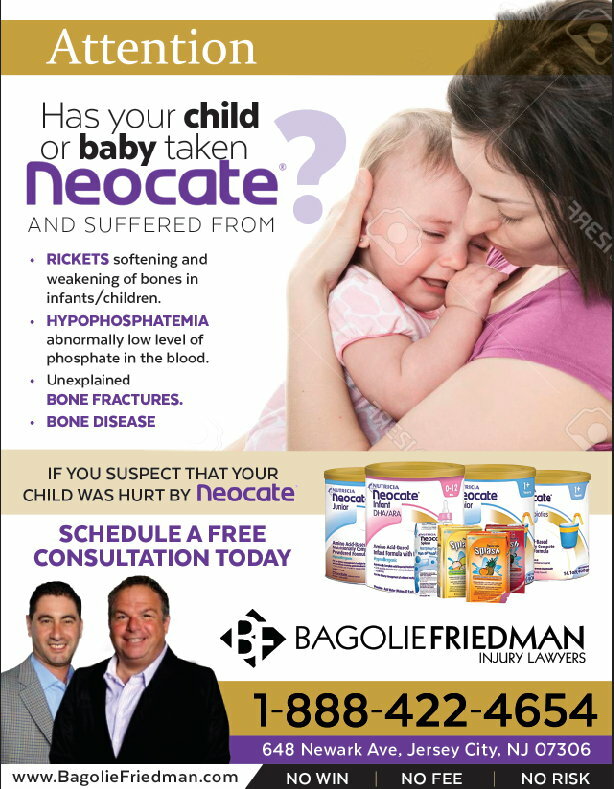 Attorneys, Ricky Bagolie and Alan Friedman, announced that their firm, Bagolie Friedman Injury Lawyers, is now taking cases involving Neocate Formula. Neocate Formula products have been reported to have affected some infants and children who have developed disorders while being fed these formulas which contain amino acids. Some disorders are serious, such as rickets, hypophosphatemia (low phosphate levels), bone disorders, and bone fractures that have occurred unexpectedly. It has been suggested by a recent study that infants, toddlers and children who were given Neocate Formula could develop serious bone disorders or unexplained broken bones. “If your child has been given these formulas, you should consider this an urgent matter”, Bagolie stated. “Parents or caregivers of infants and young children should contact us for a complimentry legal consultation if their child was given Neocate Formula, and experienced any of these issues,” Ricky says. intolerance (MFPI)GERD or Eosinophilic esophagitis or other Food-allergy-associated conditions. Since Neocate Formula is made from essential amino acids, which is protein in its simplest form, digestion is easier than formulas made from cows-milk or soy proteins. Neocate Formula and the link to potential bone disorders was first noted in an April 2017 study that appeared in the medical journal Bone. The research concentrated on 51 infants and children who had been diagnosed with unexplained hypophosphatemia. Skeletal radiographs demonstrated fractures, undermineralization, or rickets in 94% of the cases. The authors of the study made note that many of the diets of this group of infants and children consisted solely of Neocate Formula products for varied time periods prior to their presentation. The infants and children studied showed improvement once they were given supplemental phosphate or switched to a different formula. As to their findings, the reccomendation by the authors was to carefully monitor mineral metabolism in children fed elemental formula products. You and your family may be entitled to compensation for medical bills and other damages if your child was prescribed Neocate Formula and was subsequently diagnosed with rickets, dangerously low phosphate levels or unexplained broken bones. To learn more, visit the BagolieFriedman.com website or call 1-888-422-4654 for a no-cost consutation. Based in Jersey City, New Jersey, The Bagolie Friedman Injury Lawers law firm represents people injured in vehicle accidents, workplace accidents, or those who have been affected by bad drugs or products, neglegence, nursing home abuse, and other individual or class action lawsuits. Baoglie Friedman handles legal cases nationwide, with additional offices in New York and Florida. The firm has successfully challenged billion dollar companies.